Our exclusive 3-in-1 formula offers an exceptional chip-resistant gloss coat protection, a super- fast drying formula plus a beneficial advanced silk protein treatment. It helps prevent polish from chipping and peeling, adds a high gloss shine, strengthens, conditions, and protects your manicure. 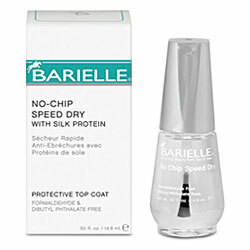 Use: Use as the last step in your manicure treatments, after allowing your manicure to dry completely. Clean and remove after 5-7 days and repeat process.